Specifically this post concerns work by Dr. Arnd Bernaerts on human activities contributing to mild winters in Europe. To start with, he is analyzing “climate” properly. Climates are plural, not singular; the term is a human construct referring to distinctly local and regional patterns and expectations of future weather. 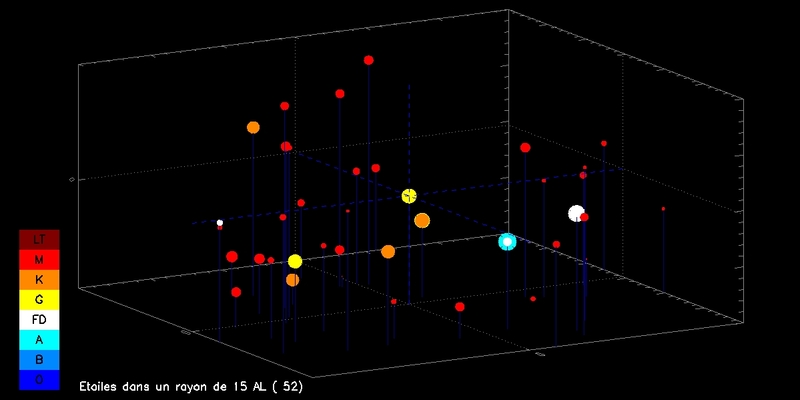 Secondly, he addresses changes observed in one particular season as a way to identify inter annual variation. Thirdly, he is well aware of oceanic fluctuations, and seeks to understand human effects in addition to natural variability. The marine environment of North Sea and Baltic is one of the most heavily strained by numerous human activities. 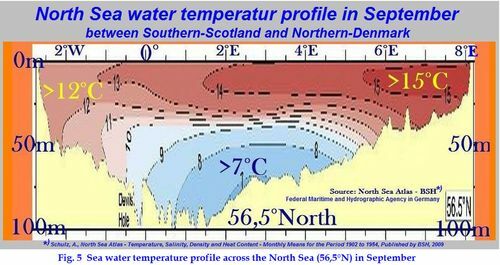 Simultaneously water and air temperatures increase more than elsewhere in Europe and globally, which cannot be explained with ‘global warming’. The climatic change issue would be better understood if this extraordinary regional warming is sufficiently explained. The regional features are unique for in-depth studies due to different summer-winter conditions, shallowness of the seas, geographical structure, and main pathway for maritime weather patterns moving eastwards. The impact of sea activities on the seasonal sea water profile structure is contributing to stronger regional warming, change in growing season, and less severe sea ice conditions. 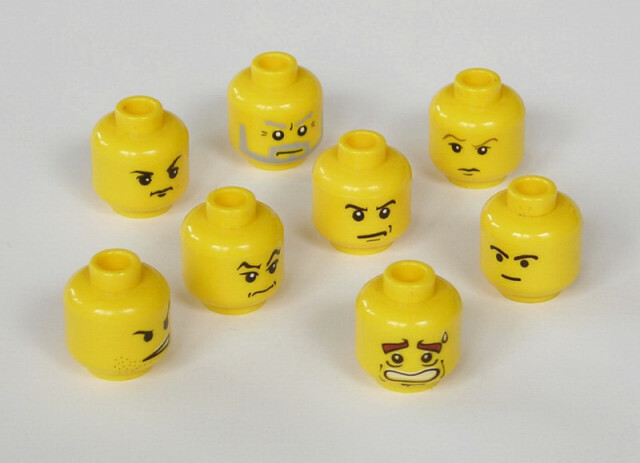 The impact of the man, whether small or large, should be understood very soon and very thoroughly. Three facts are established: higher warming, a small shift in the seasons, and a decreasing sea ice cover. In each scenario the two sea’s conditions play a decisive role. These conditions are impaired by wind farms, shipping, fishing, off shore drilling, under sea floor gas-pipe line construction and maintenance, naval exercise, diving, yachting, and so on, about little to nothing has been investigated and is understood. Two of my heroes are Dr. Pielke Sr. for his work showing how human use of the land affects climates in the locales where it occurs, and Dr. Bernaerts for exposing how human use of the ocean impacts on nearby climates. Artistic rendition of a laser driven spacecraft. Pictorial only. Some NASA people are thinking out the box and see a new way to explore space using laser technology. So far, NASA spacecraft have made 13 trips to Mars, with seven landings. The most recent — that of the Curiosity rover — took 253 days from launch on Earth to touchdown on Mars. There’s now reason to believe, however, that this journey could be significantly made faster to the point it only takes 3 days, according to a NASA researcher. 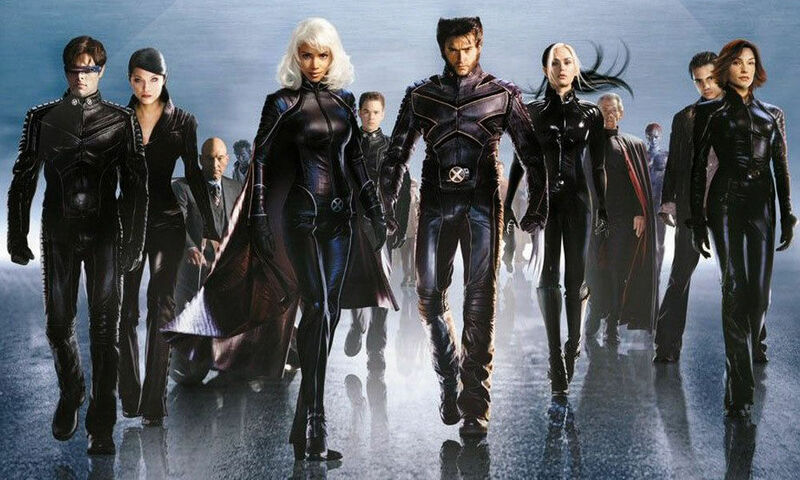 This could be possible using a ‘photonic propulsion’ system, says NASA scientist Philip Lubin. 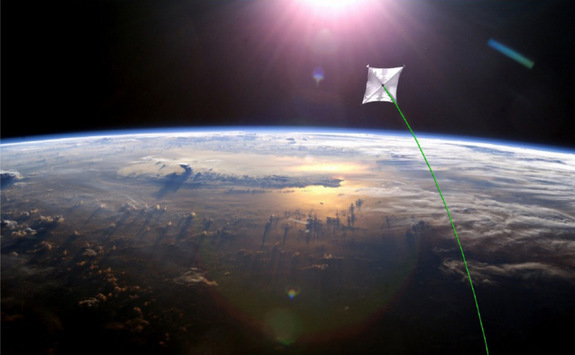 A massive laser based on Earth would fire bursts of photons into the ‘sail’ of the spacecraft and accelerated it up to 26% the speed of light (1/4c), which is unheard of in space flight. 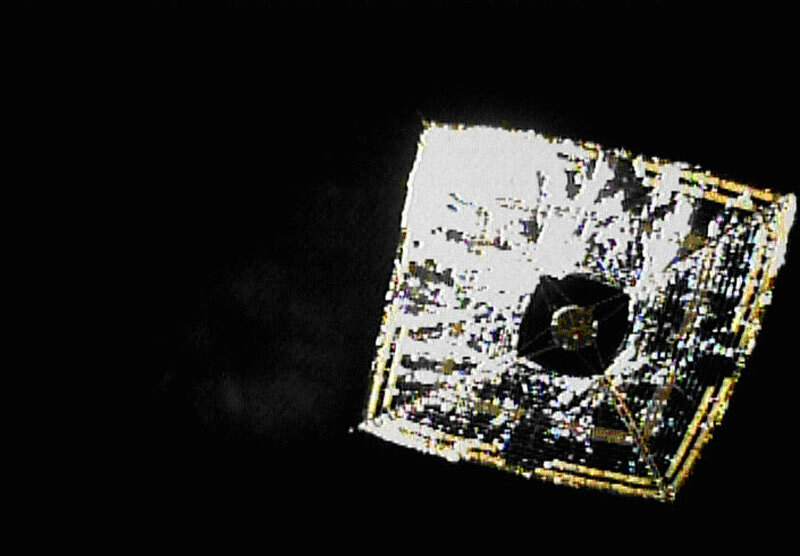 But that’s only for a tiny object with a 1 meter solar sail. Larger, more practical crafts, would be accelerated to between 1-3% the speed of light, which is still fantastic. In the nearly 60 years of spaceflight we have accomplished wonderful feats of exploration and shown the incredible spirit of the human drive to explore and understand our universe. Yet in those 60 years we have barely left our solar system with the Voyager 1 spacecraft launched in 1977 finally leaving the solar system after 37 years of flight at a speed of 17 km/s or less than 0.006% the speed of light. As remarkable as this we will never reach even the nearest stars with our current propulsion technology in even 10 millennium. We have to radically rethink our strategy or give up our dreams of reaching the stars, or wait for technology that does not exist. While we all dream of human spaceflight to the stars in a way romanticized in books and movies, it is not within our power to do so, nor it is clear that this is the path we should choose. We posit a technological path forward, that while not simple, it is within our technological reach. We propose a roadmap to a program that will lead to sending relativistic probes to the nearest stars and will open up a vast array of possibilities of flight both within our solar system and far beyond. Spacecraft from gram level complete spacecraft on a wafer (“wafersats”) that reach more than ¼ c and reach the nearest star in 15 years to spacecraft with masses more than 105 kg (100 tons) that can reach speeds of greater than 1000 km/s. These systems can be propelled to speeds currently unimaginable with existing propulsion technologies. To do so requires a fundamental change in our thinking of both propulsion and in many cases what a spacecraft is. In addition to larger spacecraft, some capable of transporting humans, we consider functional spacecraft on a wafer, including integrated optical communications, optical systems and sensors combined with directed energy propulsion. Since “at home” the costs can be amortized over a very large number of missions. In addition the same photon driver can be used for planetary defense, beamed energy for distant spacecraft as well as sending power back to Earth as needed, stand-off composition analysis, long range laser communications, SETI searches and even terra forming. The human factor of exploring the nearest stars and exo-planets would be a profound voyage for humanity, one whose non-scientific implications would be enormous. It is time to begin this inevitable journey beyond our home. Could this be the exploration technology of the future? A stunning turnaround by Arctic Sea Ice. In March Madness terms we could say: “We have a ballgame!.” Those saying Arctic ice would be a big loser in 2016 may have to eat crow. Yesterday NH ice extent grew dramatically to take a slight lead over the ten year average for day 84, and is 99% of 2016 maximum set on day 61. At 14.91 M km2 that is 330k km2 more than 2015 and 350k km2 more than SII is showing. Yesterday MASIE showed a new high extent for 2016 in strategically located Barents Sea. 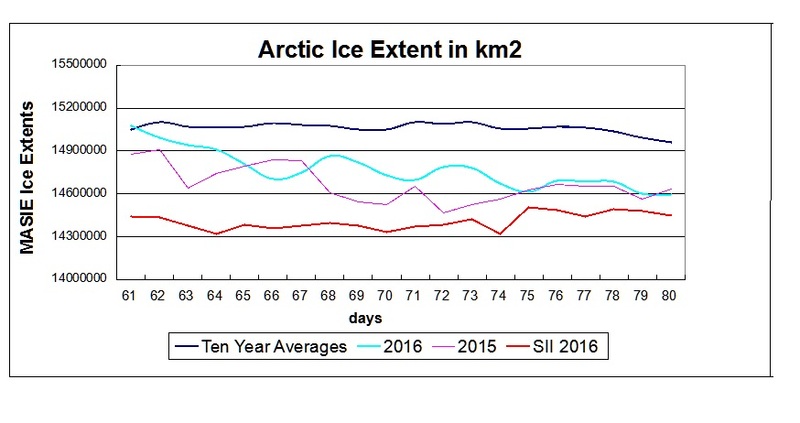 Also the Central Arctic grew to a virtual tie with its maximum set early January 2016. All seas gained ice or held their maximums, except for a small loss in Okhotsk. Earlier I compared this month in the Arctic to the March Madness of the NCAA basketball tournament, with intense competition and surprising results. In the first half of March, the ocean water was scoring at will against the ice pack, and warnings of huge losses were announced. In the second half, however, the ice is making a comeback, and the March outcome is still in doubt. This is important because March average extent sets the baseline for the melt season to come. MASIE shows significant gains in the last week, while SII has grown to set a new maximum for the year on day 81. Notably, Barents has gained back 228k km2, Greenland Sea added 81k and Bering Sea 138k, and the Central Arctic 90k. While Okhotsk has lost ice, as readers already know, Okhotsk Sea is actually outside the Arctic Circle and will melt out completely. Barents and Greenland Seas are located at the nexus of the Arctic and the North Atlantic and impact greatly the Arctic ocean as a whole. Bering is also important positioned at the Pacific gateway into the Arctic. For more on discrepancies between MASIE and SII see here. Some have expressed concern that high pressure over the Arctic could accelerate the flow of ice out through the Fram Strait. That is an important consideration. In a recent post I pointed to work by Russian scientists showing that in fact the removal of ice bergs through Fram opens up area in the Central Arctic for more ice to form. 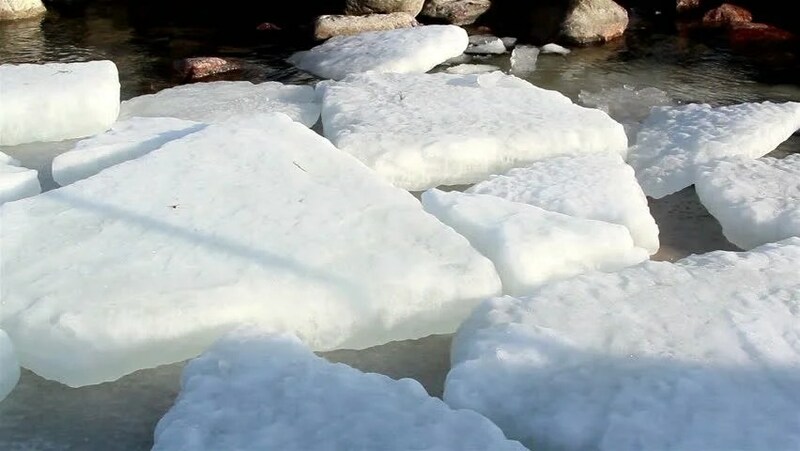 Their analysis says that after an acceleration of Fram ice loss, 4 to 6 years later there is an overall increase in ice extent, especially in the Siberian seas. Guess what? The massive cyclone in 2012 pushed out lots of ice, and here we are 4 years later with ice growth appearing. With the Arctic Oscillation (AO) expected to hover around neutral over the next two weeks, Arctic ice extent is unpredictable. In the second half, however, the ice is making a comeback, and the March outcome is still in doubt. This is important because March average extent sets the baseline for the melt season to come. At this point, 3/4 through March, MASIE shows the average monthly extent below the ten-year average but higher than 2015. MASIE shows significant gains in the last week, while SII has grown to set a new maximum for the year 2 days ago. Notably, Barents has gained back about 150k km2, Greenland Sea added 70k and Bering Sea 110k, while Okhotsk has lost 100k. As readers already know, Okhotsk Sea is actually outside the Arctic Circle and will melt out completely. While Barents and Greenland Seas are located at the nexus of the Arctic and the North Atlantic and impact greatly the Arctic ocean as a whole. Bering is also important positioned at the Pacific gateway into the Arctic. Donald and Hilliary in Grease! Opening this summer, the new production of the classic American musical Grease. Features Donald Trump and Hilliary Clinton in the entertaining match between the prim and proper cheerleader and the rebel hot rodder from New Jersey. 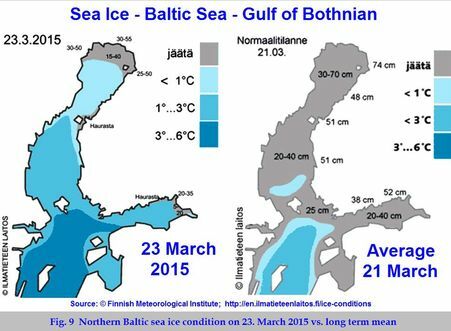 Updating Arctic ice extents for the first 20 days of March the peak ice month. Lots of changes and surprises, just like the NCAA basketball tournament. As March has progressed, this year and last MASIE shows ice has declined. Meanwhile MASIE ten year average held steady, and 2016 SII added extent in the last week. The gap between MASIE and SII is narrowing in 2016, though SII extents still average almost 400k km2 less for March. Region 2015080 2016080 km2 Diff. Comparing 2016 on day 80 with 2015 shows the important ice deficits are on the European and Canadian sides: Barents (even lower than last year), along with Greenland Sea, and Baffin Bay. In contrast to 2015, Okhotsk is much more normal this year and almost offsets the losses elsewhere. With AER and CPC showing the Arctic Oscillation neutral presently, and 14-day forecasts for more of the same, no one knows what to expect. We can only watch and see. The warm March sun is melting the snow and ice in our neighborhood, so it seems like a good time to talk about the sun and Arctic climate change. Again, I am relying on a book by Frolov et al. Climate Change in Eurasian Arctic Shelf Seas, Centennial Ice Cover Observations (with some additional more recent material below). Frolov et al. explore the connection between solar activity and these atmospheric processes. They are not jumping to conclusions and recognize that uncertainty surrounds the mechanisms between Solar Activity (SA) and Arctic ice variability. 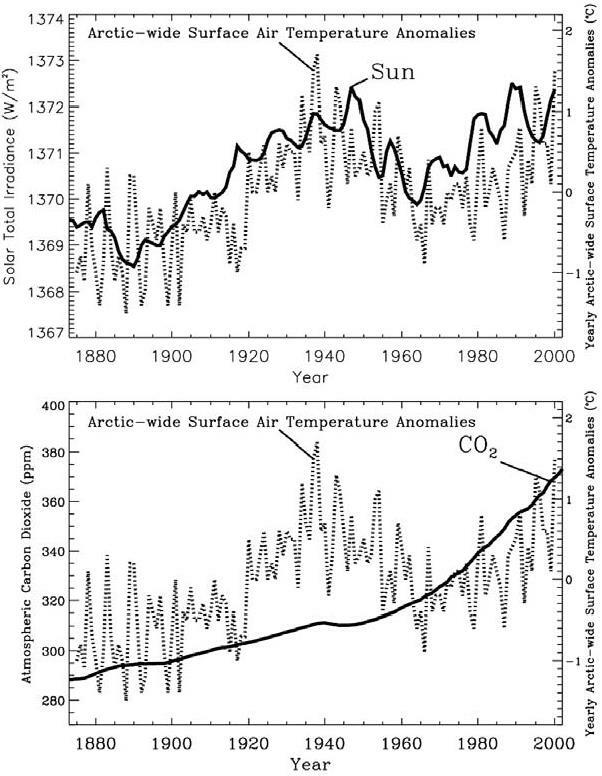 The variation of temperature matches the TSI curve far better than it matches the CO2 curve. However, the Hoyt and Schatten model for TSI is just one of many, and other models lead to very different patterns for TSI vs. year. Furthermore, climate modelers would argue that the temperature curve in the second warming epoch represents the continuation of the first warming epoch, interrupted by a period from about 1940 to about 1980 when increasing aerosol concentrations outweighed the effect of increasing greenhouse gases. Therefore, Figure 6.5 is just one representation of many that could be derived. Nevertheless, if Figure 6.5 were taken at face value, the temperature and TSI variation charts would suggest the presence of both a positive “100-year” trend and quasi 60-year cyclic oscillations. While Figure 6.5 is suggestive, the fact remains that we really do not know how TSI varied prior to the advent of satellite measurements around 1980. 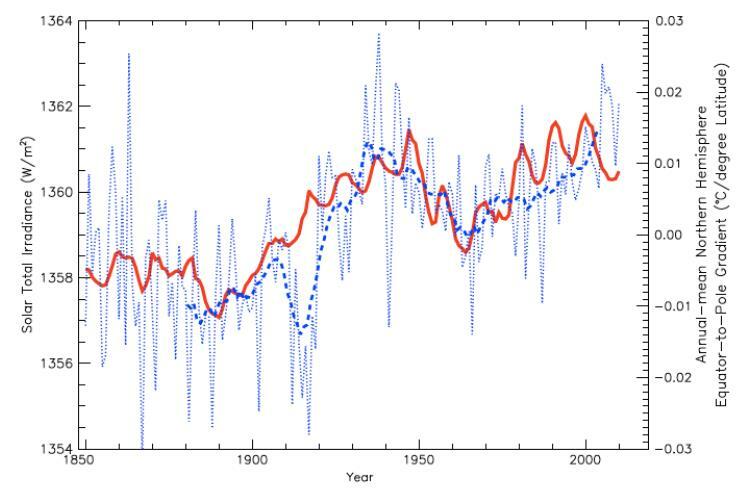 Figure 6.5 demonstrates that the form of the variability of Arctic surface temperatures during the 20th century resembles the variability of the Hoyt and Schatten model for TSI. This is suggestive that variations in TSI may have been an important factor in 20th century climate change. Though the total variance of TSI from 1880 to 2000 according to Hoyt and Schatten was 384 W/m2, the simple spreading of this flow over the spherical area of the Earth is incorrect. As we show in this work, a significant part of TSI variance influences the high-latitude regions. Furthermore, as was noted in Section 5.4, Budyko (1969) concluded by calculations that solar constant variations of several tenths of % are sufficient to induce essential climate changes. Some may claim the Hoyt and Schatten model is outdated, so I provide recent comparable results from Jan Erik Solheim October 2014 here. The reconstruction by D. Hoyt and K. Schatten (1993) updated with the ACRIM data (Scafetta, 2013) gives a remarkable good correlation with the Central England temperature back to 1700. 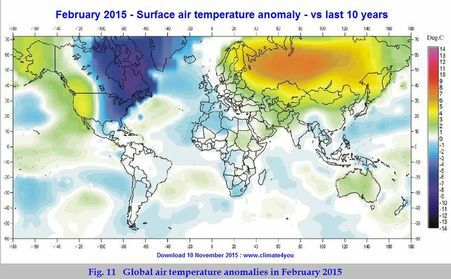 It also shows close correlation with the variation of the surface temperature at three drastically different geographic regions with the respect to climate: USA, Arctic and China. The excellent relationship between the TSI and the Equator-to-Pole (Arctic) temperature gradient (EPTG) is displayed in figure 4. Increase in TSI is related to decrease in temperature gradient between the Equator and the Arctic. This may be explained as an increase in TSI results in an increase in both oceanic and atmospheric heat transport to the Arctic in the warm period since 1970. 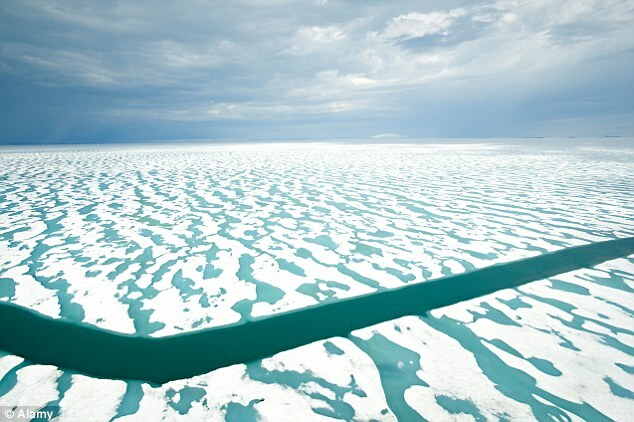 White sea ice in the Arctic melting from the sun, and also reflecting back solar energy. The recent leak in California attracted mass media attention and now Canada and the US have announced reductions in methane emissions, timed to show PM Trudeau’s visit was not just window dressing. But how important is methane as an issue for the climate or the environment? 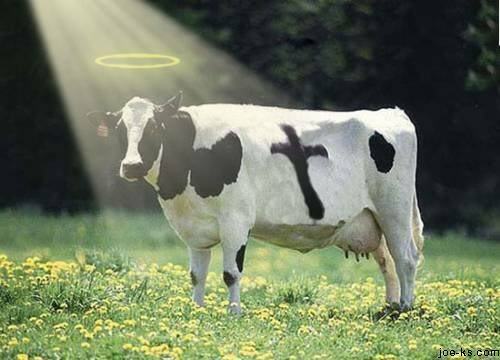 More information at THE METHANE MISCONCEPTIONS by Dr Wilson Flood (UK) here. It is clear from the above text that methane is not presently a threat, so concerns are raised about a possible outburst of methane from reserves under Arctic ice. Dave Cohen explains the the alarms from methane hydrate doomers at his blog here. Catastrophic, widespread dissociation of methane gas hydrates will not be triggered by continued climate warming at contemporary rates (0.2ºC per decade; IPCC 2007) over timescales of a few hundred years. 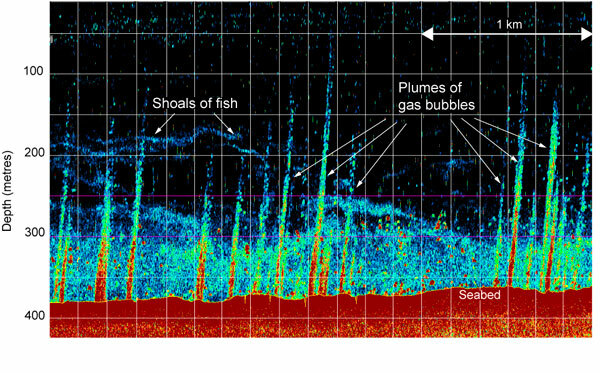 Most of Earth’s gas hydrates occur at low saturations and in sediments at such great depths below the seafloor or onshore permafrost that they will barely be affected by warming over even 103 yr. Even when CH4 is liberated from gas hydrates, oxidative and physical processes may greatly reduce the amount that reaches the atmosphere as CH4. The CO2 produced by oxidation of CH4 released from dissociating gas hydrates will likely have a greater impact on the Earth system (e.g., on ocean chemistry and atmospheric CO2 concentrations; Archer et al. 2009) than will the CH4 that remains after passing through various sinks.